Making some extra money. | The House of Martins The House of Martins: Making some extra money. Have you heard of the $5 jar? It's when you make a rule that you won't spend $5 bills. Anytime you have one in your possession you add it to the "jar" and it makes for some great extra spending money. Jonny and I have had one on and off for YEARS. I know a handful of readers and friends that have instituted it in their houses too. We've kind of changed / expanded the idea lately around our house. I use it now as a place to put the little extra money that comes into our hands and I really look forward to spending it in Hawaii next month. Old cell phones (and other electronics). I sold 3 old cell phones recently through Gazelle and made over $100. One phone had a completely ruined screen and the other two didn't even turn on. It was super simple to do and helped me get rid or something that I wasn't sure what to do with. Even if you think your phone is too old - check it out. If I ever find my old iPods I'm selling them too. Facebook Resale Groups. This is my first stop when I'm cleaning out the kid's stuff. Toys we don't play with, clothes that don't fit, books we've outgrown. Whatever it may be - I just snap a picture and post it on my neighborhood's resale group on Facebook. Then you just leave it on the porch - they pick it up and leave the $ under the mat or in the mailbox. If I don't sell it within a week - it goes in the donation box. Paid Surveys. Most paid Survey sites I don't participate in - mostly because I don't think they are worth the time you have to put in. There are two apps I have on my phone that are survey apps because. Surveys On the Go and 1Q. Surveys On the Go pays out at $10 and the surveys are short and sweet. Easy to do on your phone. 1Q is even easier. It is literally 1 question sent via text and you answer it and get .25 cents to .50 cents sent to your PayPal immediately. Not big money - but an easy way to pad your PayPal account! Writing Jobs. If you like writing check out the ProBlogger Job Board every so often for opportunities to write and get paid for various blogs and websites. When my work is slow - this is where I can turn to find some additional writing opportunities. I've found some great opportunities through this site. Clean your closets for $. If you have the time there are some great apps you can use to sell your clothes (and your kid's clothes) pretty easily. Tradesy is my app of choice for my clothes and accessories. For the kids - I like My Kid's Threads. There are the local consignment shops (Crossroads Trading Company for adults and Once Upon a Child for the kids) But I always end up feeling like my time was wasted for the little amount of money the payout. Get rid of DVDs and CDs. I mean, you really don't need them anymore. I got $7 for 11 DVD's on SecondSpin. It was super easy to do. You pay shipping up front at the Media Mail rate and they reimburse you. So there you go. 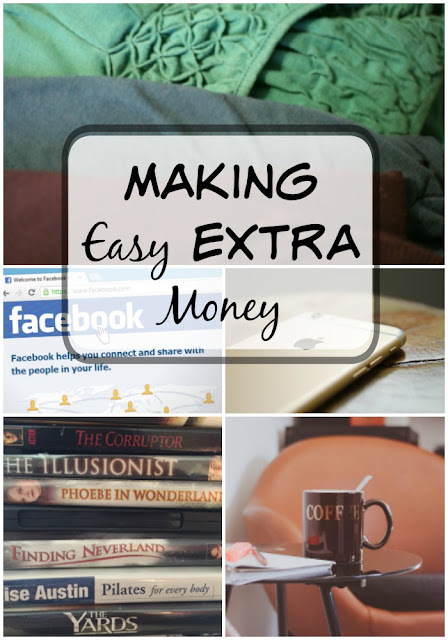 Some quick ways to make a little extra money. It's always nice to have extra cash laying around and extra money in a PayPal account. Plus, most of these options also help you clear out clutter in your life! Do you have any ways you make a little extra spending money? Share it in the comments.